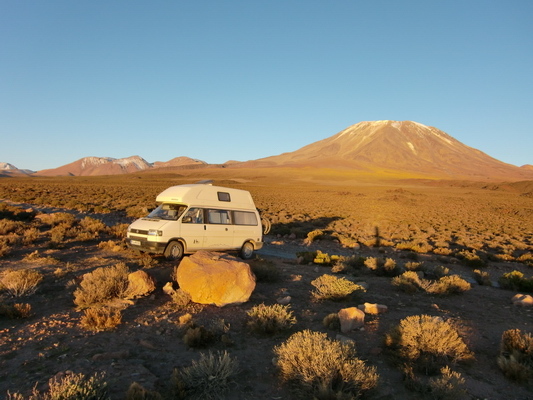 The first part of the street to the Laguna Lejia was in a very good condition, no problem for our car. 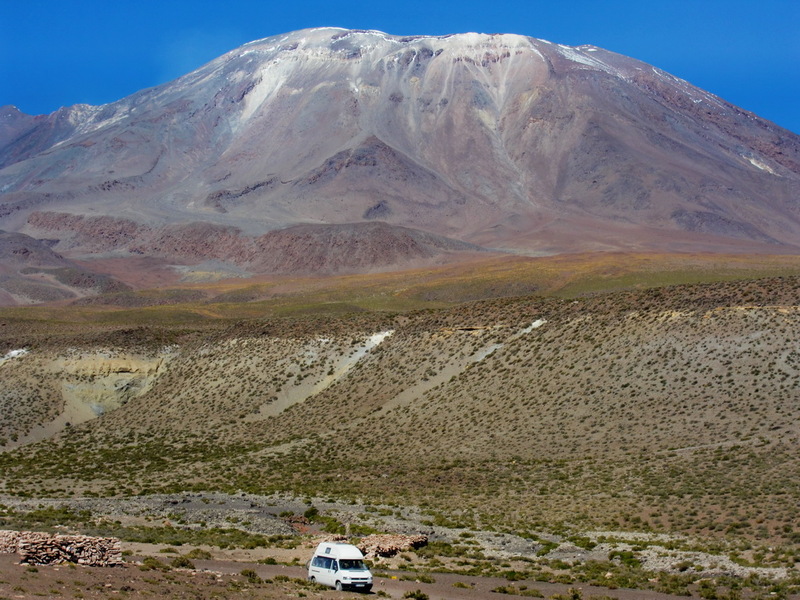 We drove the first day up to 3800 meters to ensure proper acclimatization. We found a wonderful remote spot for the night. The next day the road became very rugged and steep. In addition the power of our engine declined due to the thin air. 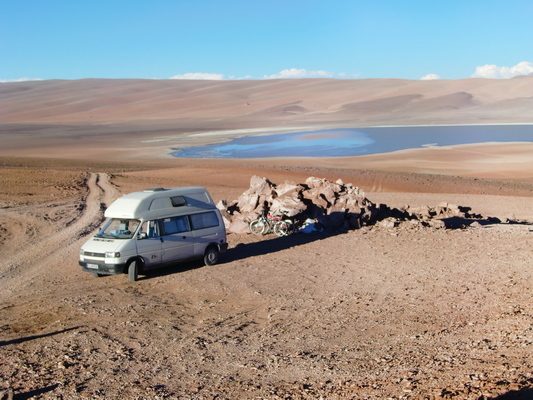 Somehow we achieved the pass in front of the Laguna Lejia. But the street down to the lake was very steep and a little bit muddy. Consequently we did not dare to drive down, because we were not sure if we make it back. We were lucky again, because there was a nice campground just on the pass. 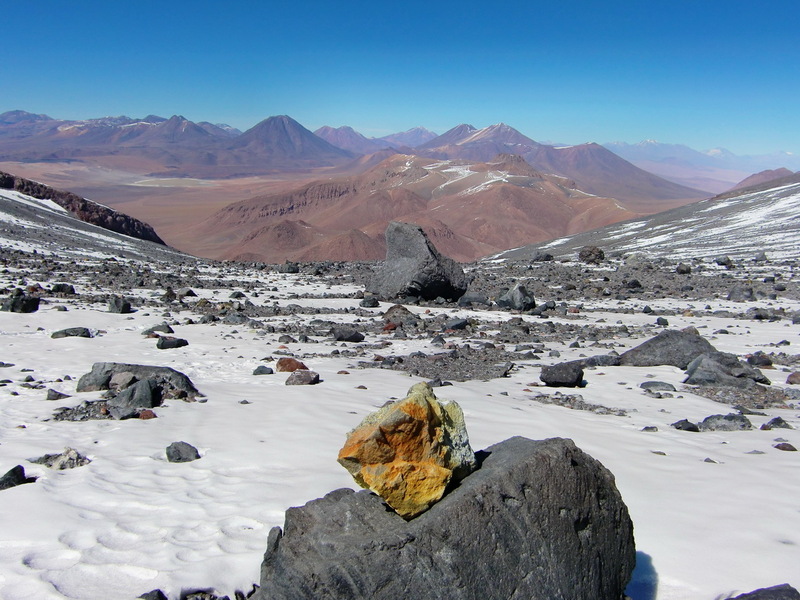 And we felt the altitude of more than 4400 meters. 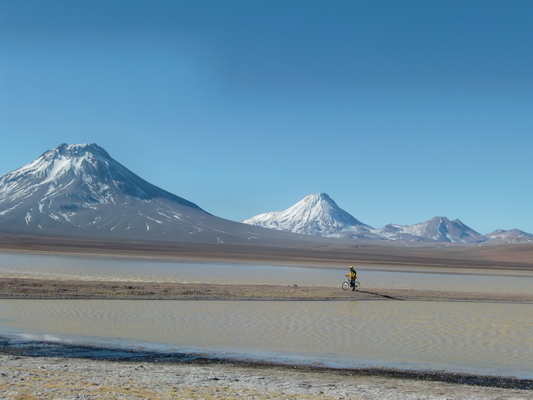 So we decided to explore the Laguna Lejia and the way to the foot of Lascar the next day. 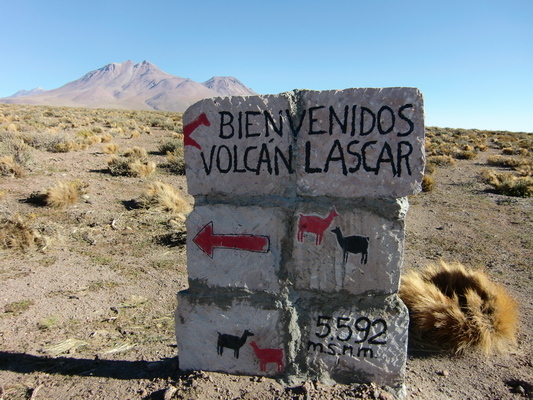 Only 10km to the base camp of Lascar and the area looks very flat on the map. The first part was nice because we headed down to the Laguna Lejia. But then the gravel street became very soft - driving with the bicycle was very exhausting. Besides that the street disappeared more or less in various tire tracks. And we felt the altitude; so we returned after approximately 6 kilometers. Fortunately down was much less exhausting than up, but we immediately we got big blows on our back because the track was extremely corrugated with deep holes. Leaving the spur meant sinking into the gravel and finally stopping. 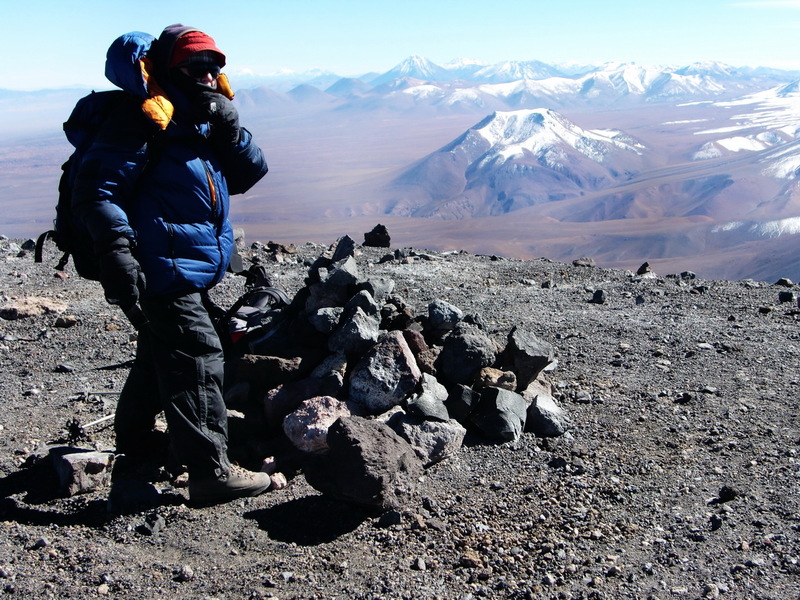 On the next day we took our little tent, sleeping bags and a lot of water into our backpacks and we bicycled more or less to the base camp of Lascar. 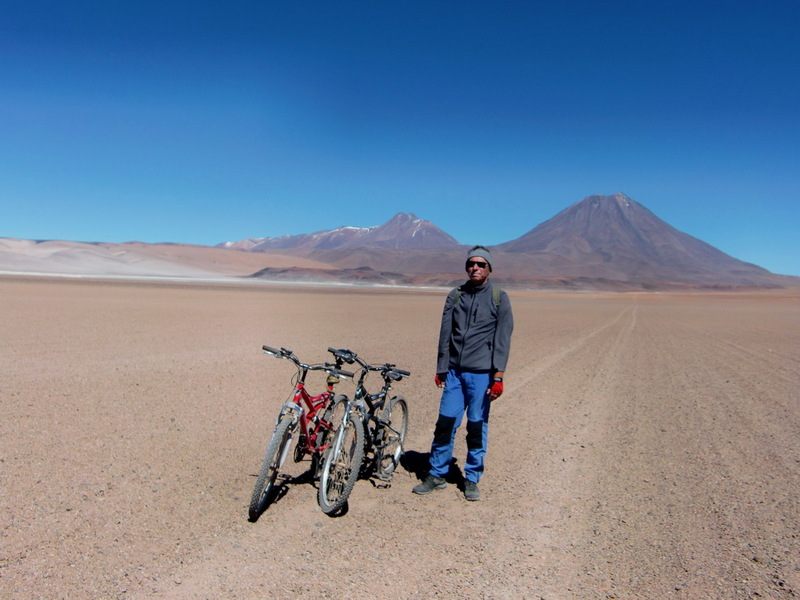 Due to the gravel and steepness we had to shuffle our bicycles a lot. 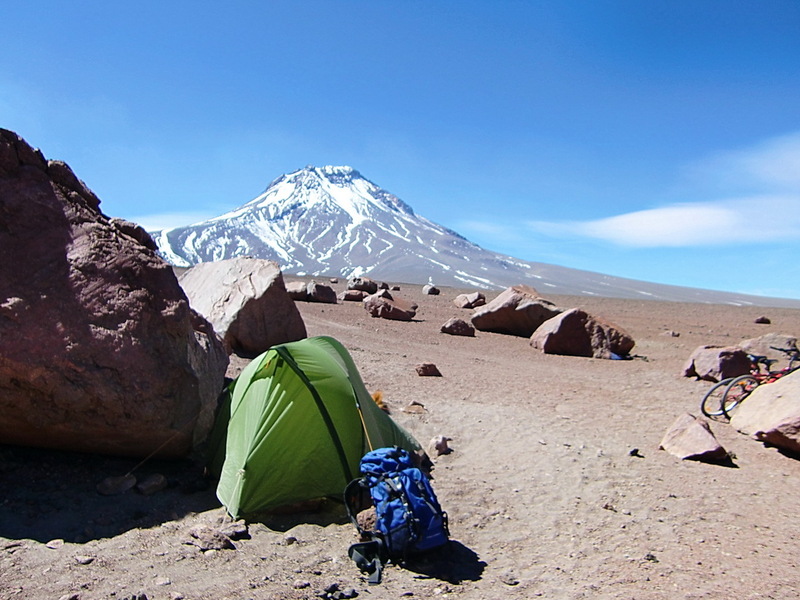 It was closed to sunset, when we arrived at the base camp of Lascar and built up our tent. We started very early at 6:00AM on the next morning, because we wanted to return to our car the same day. The night in the tent had been a little bit windy and we were afraid running out of water. Finally we achieved the saddle between the central and east summits after more than 4 hours walking. It became very smelly like rotten eggs. Fortunately there was a strong wind which blew off the smoke from the crater. 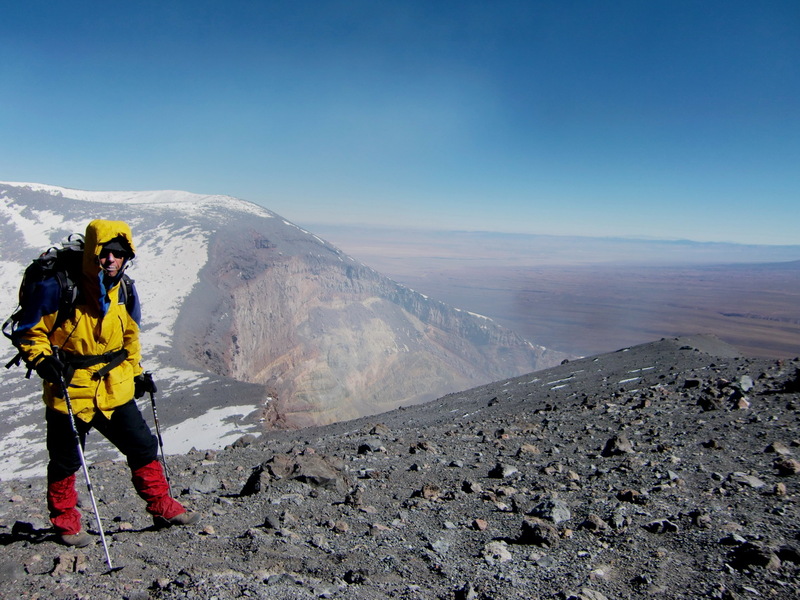 We decided to go to the east summit because it has a good path without much snow, it is closer to the crater and it has more or less the same height like the central summit. 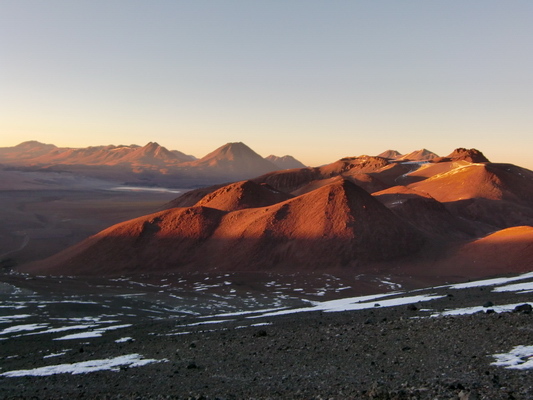 The view from the summit was overwhelming: On the one side many volcanoes, on the other side the enormous smoking crater with the Salar de Atacama. 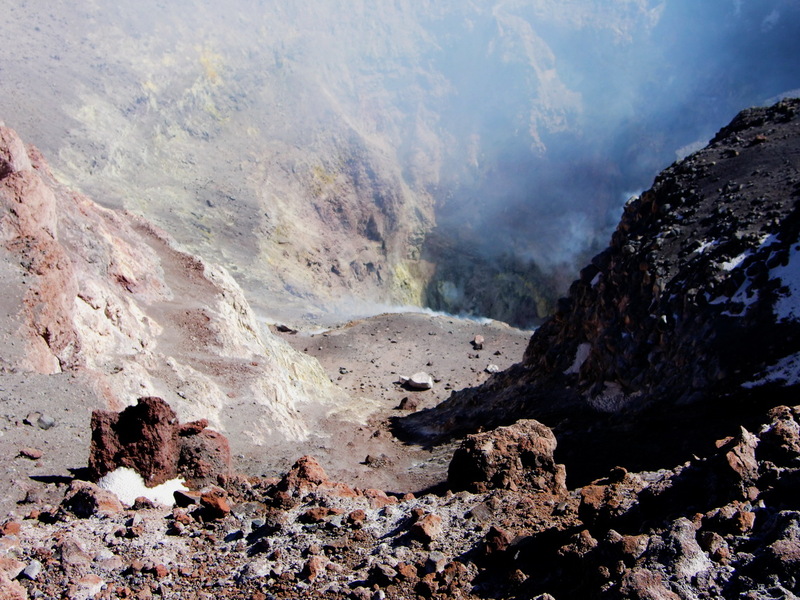 The crater was fascinating; we spent a lot of time to watch the smoke and colors. We were back to our tent around 2:30PM, thanks to the gravel which allowed us a fast descent. The drive with our bicycles back to the Laguna Lejia was fast, but hurting our backs (see above the exploration trip). Very challenging was the last part 100 vertical meters up to our car. We placed the heavy backpacks on the bicycles and pushed them up. Dinner was short with sausages and potatoes. After it we slept immediately besides the fact that it was just 7:30PM. The next day we drove back without major problems to the main street. 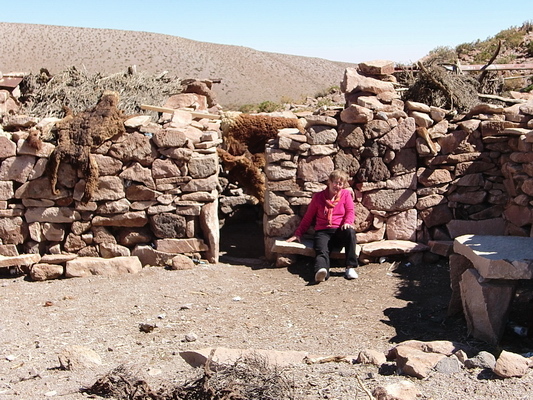 We passed some deserted villages. It seemed that some houses had been abandoned in a hurry, because a lot of stuff was still inside like toys, kitchen tool or pelts. 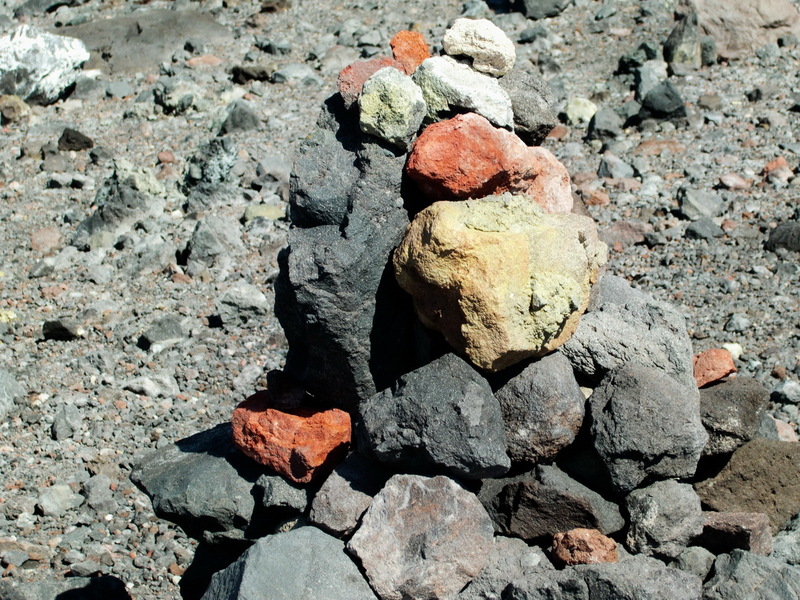 There was also a lot of relatively fresh magma on the ground; possibly the people had fled from an eruption of the volcano. 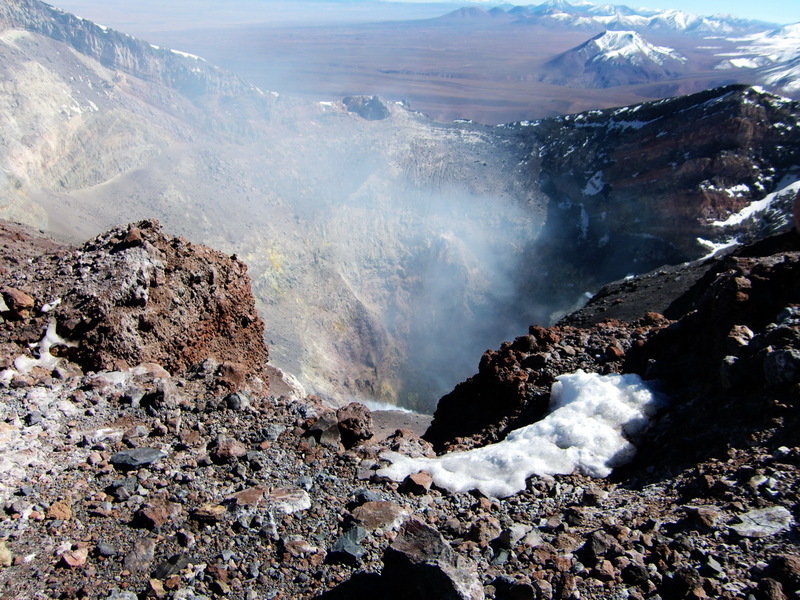 Lascar is a dangerous volcano; it had major eruptions in 1990 and 2006. But it is also a majestic and beautiful mountain.